Holidays – you’d think there’d be plenty of time to crochet during a week away in sunny Anglesey but somehow there wasn’t, what with visiting castles and gardens, exploring ruined mansions, walking along the coast, looking at the stars and trying to remember where to find Orion and the Saucepan (well, it doesn’t look like a plough to me! ), eating chips on a nondescript pier, taking in views of the Strait and Snowdonia… that kind of thing! 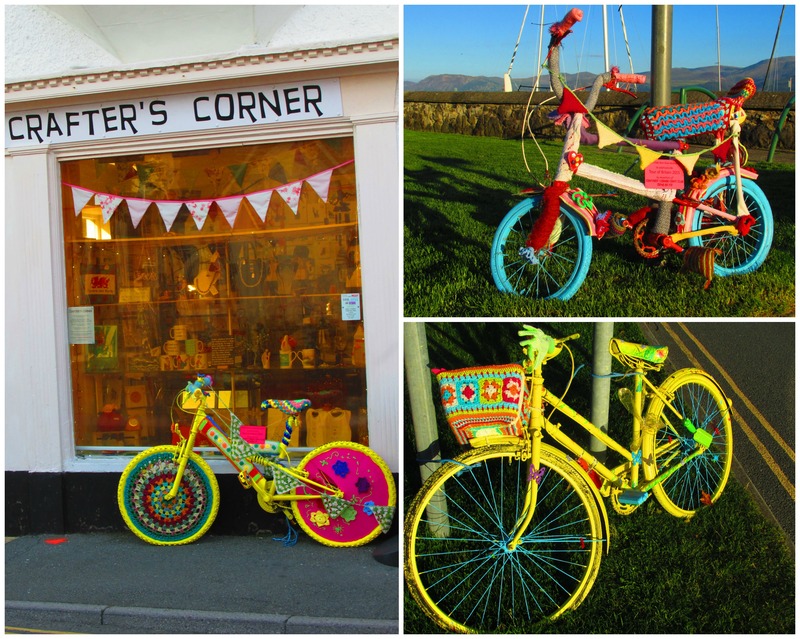 The crochet worth mentioning was in the shape of bicycles – there were a few dotted about Beaumaris that had been brightly painted and decorated in kaleidoscopic crochet, the work of the Crafter’s Corner Craft Club to celebrate the Tour of Britain. 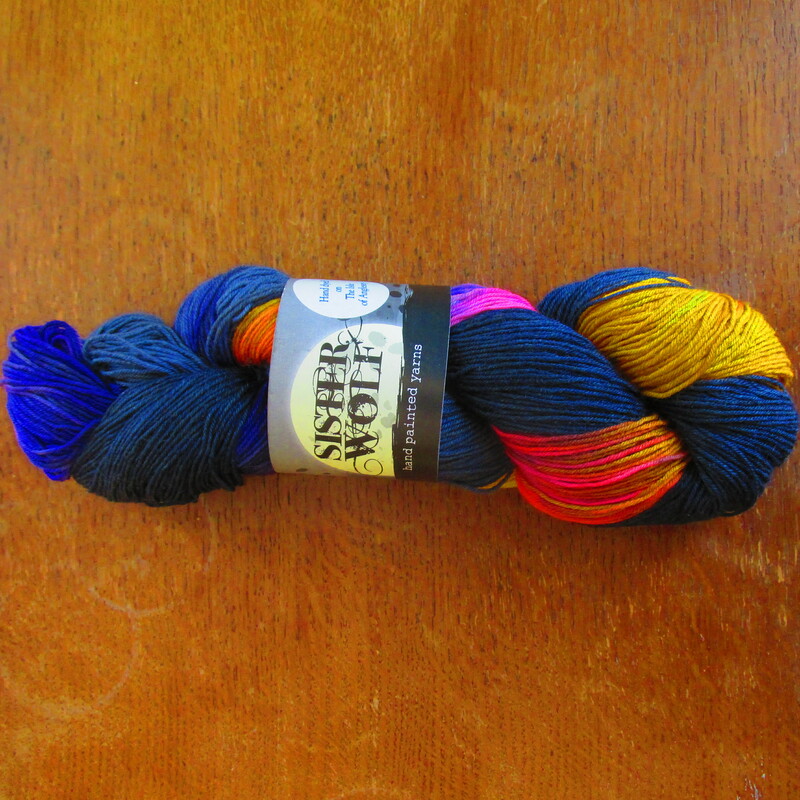 Well, who wouldn’t want to buy yarn called Sister Wolf?? Wish I’d thought to ask if there was any specific meaning behind it. Next time! 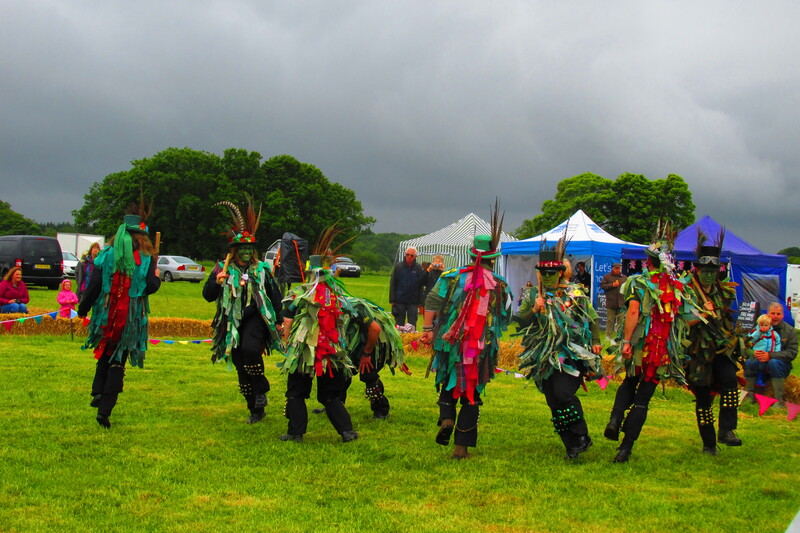 Sunny days are for exploring gardens; rainy days for museums.While visiting friends in west Wales this summer, one such soggy Sunday endeared to us the idea of a trip to a historical establishment. 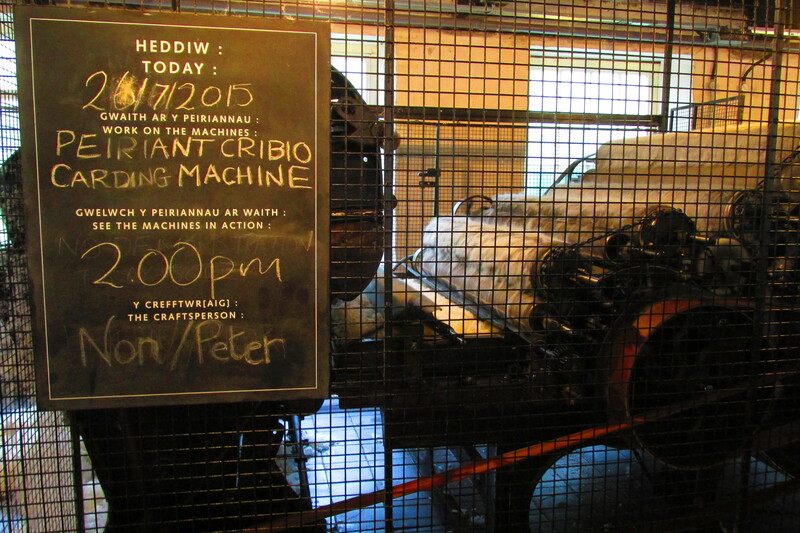 So off we went to Dre-Fach Felindre to nosey around the National Wool Museum. 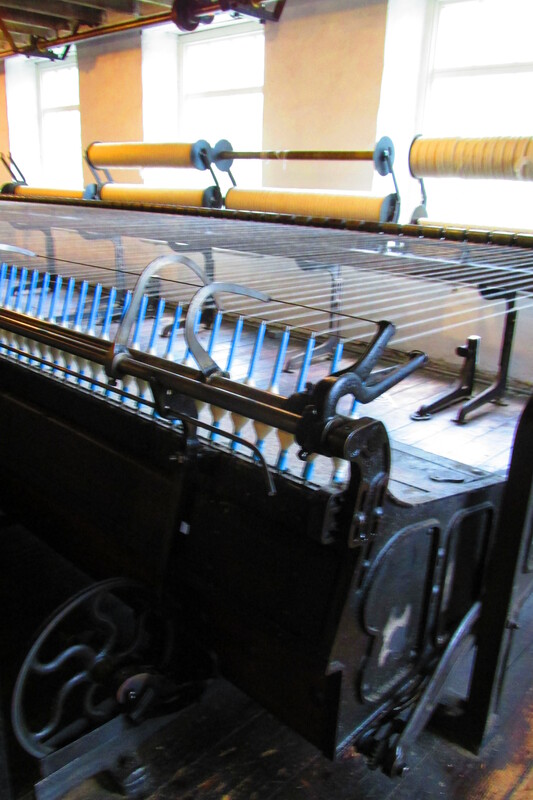 Giving an insight into the traditional and industrial processes of converting fleece into yarn and cloth, this museum also documents the history of the wool trade in Wales. It all starts, of course, with sheep. Different breeds have adapted to cope with their contrasting environs, and the texture of their fleece reflects this. 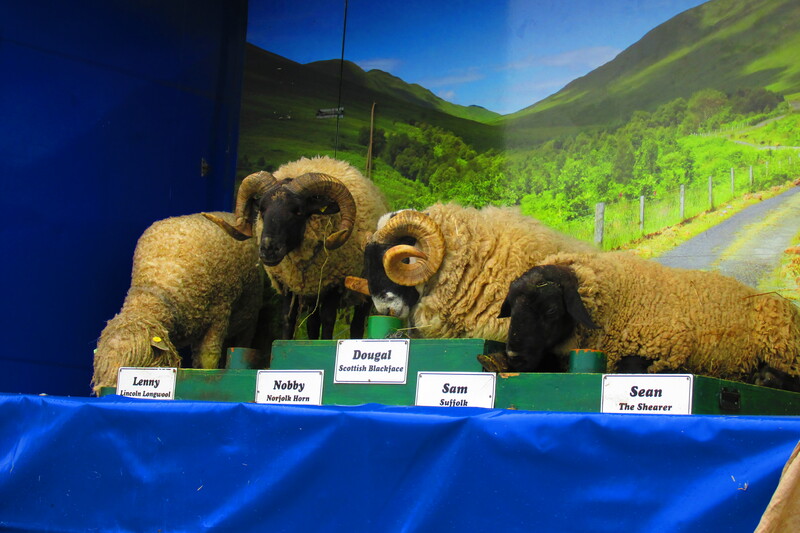 For example, the hardy Welsh Mountain sheep gives us a coarse wool, whereas the Llanwenog (a lowland breed typical of the Teifi valley) has a soft, fine wool. Prior to shearing, sheep were washed in streams, rivers or the sea, as this was thought to make hand-shearing easier. Men would take to coracles to guide any stray sheep or those getting into trouble in the water. I love the unusual image of sheep-herding in coracles! Though shearing was the most typical way of removing wool from a sheep’s back, there were other ways. ‘Slipe wool’ was obtained from dead sheep purchased from slaughterhouses which gave cheap, low-grade wool. Fleece was detached from the carcasses by throwing them into lime pits, and the skin and lime later separated from the wool in a large revolving drum. A less gruesome method was the old Welsh custom of gwlana. This involved women traipsing along the drover’s roads known as llwybrau gwlan, or woollen paths, retrieving oddments of wool caught up in hedgerows. This was no pleasant stroll in the country – these women would have been up at daybreak and, come sun down, would have trundled many miles in every weather, hefting home heavy sacks of wool gathered by stooping and bending much of the day. Even so, gwlana was a social experience and something different from the drudgery of everyday life. The wool that was collected was cleaned and spun by hand, to be knitted into socks or caps, or woven into blankets that could be sold to earn extra pennies on top of meagre farm wages. With the arrival of the railway in the late 1800s, the need for drovers declined, and woollen paths fell out of use. But the role of drovers had extended beyond livestock: they were the original bankers of Wales.. The first Welsh bank notes were issued by Banc y Ddafad Du (the Black Sheep Bank) of Aberystwyth, and Banc yr Ychain Du (the black Ox Bank) of Llandovery. Once in the mill, wool had to be sorted and then prepared for spinning. 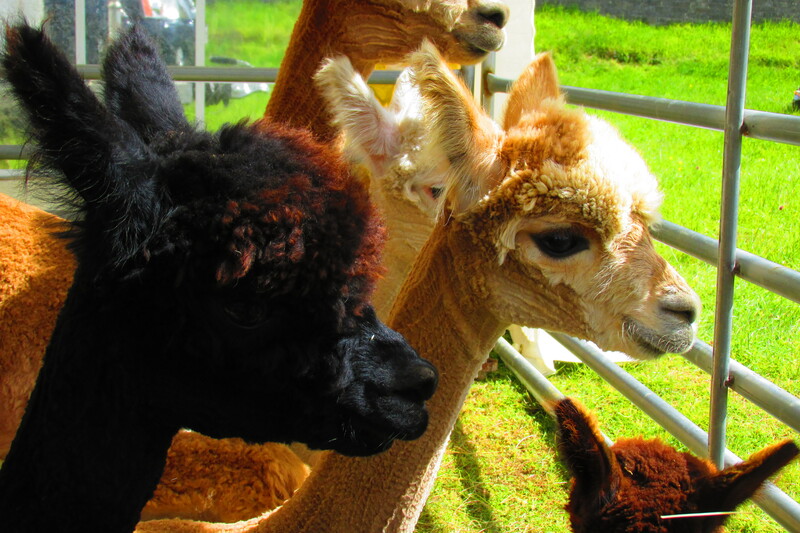 Fleece cannot be spun straight away as it is too ravelled, and undergoes a treatment called ‘willowing’. Prior to mechanisation, this was done on a felking board, using sticks probably cut from willow. Come the industrial ages, a willowing machine combed the wool, teasing out tangles on a metal toothed roller. This transformed the wool into a sort of candy-floss cloud of fibre. Another combing task. ‘carding’, turned the soft fluffy fibres into strips of wool known as ‘rovings’ or ‘rolags’. By hand, this was done with carding bats which had metal or wire teeth. The earliest carding bats had teasel or thistle heads. Being a gardener for a living, I found this especially interesting. The scientific name for thistle is Cardus, from which the word carding is derived. The Welsh for teasel is llysiau’r cribwr and translates as ‘the carder’s plant’. During my visit, there was a demonstration of the willowing and carding machine in use, and I found it a bit odd that the machine operatives were called craftspeople. This jarred with my sense of the word craft, as I tend to think of it in relation to non-mechanised activities. Is that just me, or does anyone else have this perception too? The rolags produced by carding were then spun, converting the fluffy wool into strong yarn. Traditionally done by individuals at spinning wheels, the invention of a machine called the ‘spinning mule’ put a lot of local spinners out of work. This machine wheeled backward and forwards, drawing out and twisting the fibre together, producing 400 threads at once. 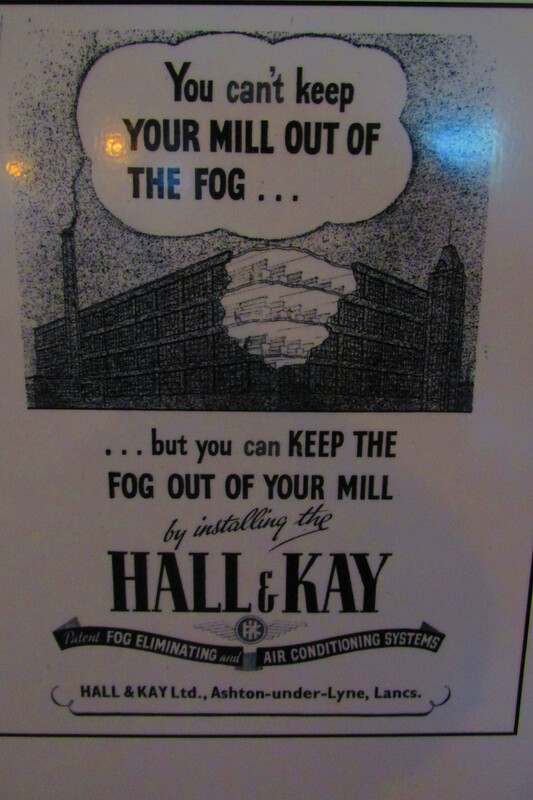 It required only a single operator, saving the mill owner money in wages and allowing the maximisation of profit. Once wound onto bobbins, this yarn was ready for knitting or weaving. One way of incorporating some knitting into the day was whilst walking: in the 19th century, women in Cardiganshire were known to knit their way down mountains, carrying peat harvested from the higher land to use as fuel in coastal areas. I’ve seen people knit on public transport, but I’d be worried about tripping up and rolling downhill like a giant ball of wool! A vital rural industry in the 18th and early 19th centuries was the home knitting of socks and stockings. Wares were sold door to door or at markets, as well as to itinerant stocking merchants. People who knitted for money frequently convened for their shared purpose, merging work with play… and a bit of friendly (I hope!) rivalry. Sometimes, competitions called Gwau Gwryd were held, testing who could most speedily knit a given measure of wool. Of course, mechanisation also put knitters out of work as stockings made in factories were cheaper, and these finer stockings became more fashionable. I think that’s why crochet appeals to me: it has yet to be mechanised. Despite putting many people out of work through industrialisation, the woollen mills were the biggest employers in the Teifi valley until the 1980s. The wool museum, on the site of the old Cambrian mill, still produces wool and cloth today. And visiting was a wet afternoon well spent. 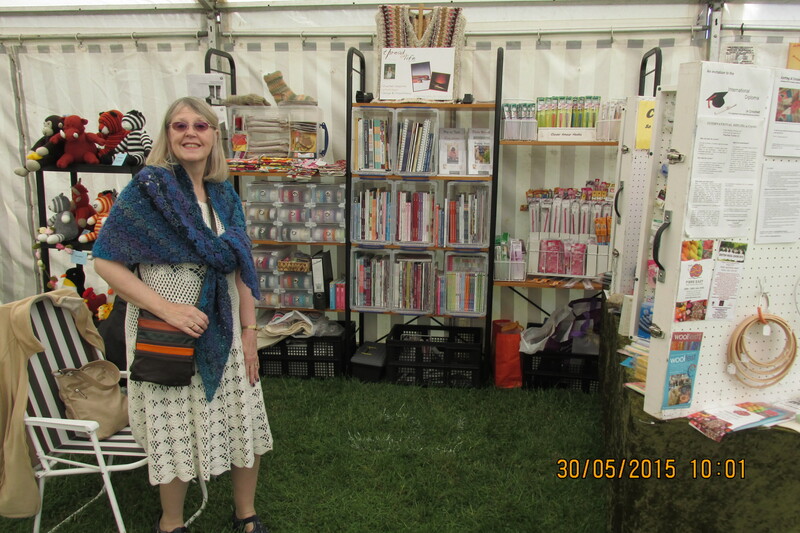 One of my lovely gardening clients, who knows I’m a crochet addict, told me of an exhibition she’s heard about on the radio called Centenary Stitches. It sounded very interesting, and I was keen to go. Finding out it was in Lincoln, I figured it was a bit too far to visit just for an exhibition! But then I remembered I had some money-off vouchers from a delayed train journey in the summer, so I decided to use them to day-trip halfway up the country especially. 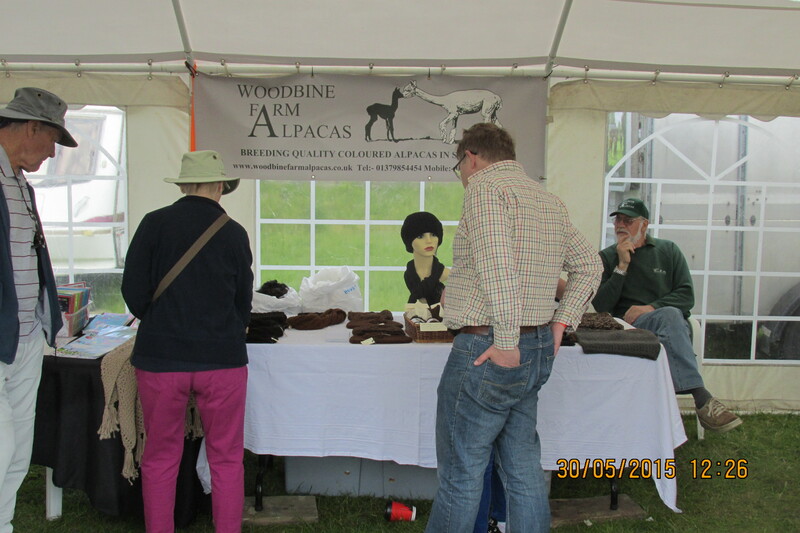 And I’m glad I went – it was a small exhibition, but I spent nearly an hour and a half having a good ol’ rummage around. The Centenary Stitches project grew from the costuming of a community film called Tell Them of Us. The aim was to create something centred around the war story of ordinary people, not celebrated already by fame or high rank. But these are the people about whom there is typically less documentation. However, one family – the Crowders from the village of Thimbleby in Lincolnshire – had maintained a comprehensive archive containing letters, memoirs and scrapbooks, photos and other items from the Great War years. From this family archive, a script and screenplay developed. If the stories of everyman are difficult to discover due to lack of records, costuming and clothing can be even more tricky. Fabrics are fragile, especially the woollens, being susceptible to moth damage or easy to repurpose, for example, through felting. Photographic evidence provides little more information, as these tended to record special events rather than daily attire. Knitting patterns from the era are a more reliable source, though these are problematic for the 21st century yarner thanks to the difference in culture; in the early 20th century, most girls were schooled in knitting and crochet, so patterns didn’t need the details required by many today. For instance, sock instructions could use the short-hand “turn the heel” and the reader could proceed without panic and you-tube how-to guides. Some of the items in this exhibition are clothes crafted for the film, but there are also reproductions of other items from World War One. There are two woolly stories to be told here: one is military – how knitting affected the lives of troops at the Front; the other is social – the tale of women and how their clothing reflected their increasing emancipation. Military uniforms were not enough for the needs of the soldiers, and were supplemented with knitted accessories that came to be known as ‘comforts’. These were sent by women to their loved ones in the trenches, but also distributed by organisations like the Red Cross and Regimental Comforts Fund. Such items included scarves, gloves, balaclavas and smooth-seamed socks. Lord Kitchener, British secretary of state for war and the face of “Your Country Needs You” posters, is credited with the invention of an invisible grafted toe seam which helped prevent blisters – sock patterns of the time were made with a seam up the toe that tended to cause chafing. Among the more unusual knits were knee warmers, often worn over bandages in hospital, and rifleman’s gloves without thumb and trigger finger. Despite the value of their endeavours, many of the crafters put themselves down as being just a “Sister Susie”, and denigrated their war work , believing it to be a minimal contribution because they did not suffer or don a uniform. But VAD nurse Olive Dent noted otherwise in her diary: “We nurses know how much the gifts and comforts are appreciated… Every stitch..meant a few minutes greater comfort – and correspondingly less pain – from an aching body tortured on our behalf, for our defence and birthrights.” She goes so far as to say that these Sister Susies performed “some of the most valuable war service”. The process of women becoming more active participants in society, in roles that were previously denied them, meant that their clothes had to change. Greater freedom of movement became necessary. There was a shift from garments which needed to be clung to like the shawl, to those such as jumpers and cardigans. Women started to ditch the restrictive corset and this was hastened by metal shortages brought about by the war – metal, of course, was needed to construct the framework of corsets. Apart from maintaining a rigid, upright posture, corsets also provided an insulating layer to the torso so all that would be required to stave off the chill might be a shawl. Without this thermal layer, those same garments enabling freer movement, the waistcoats etc, became fundamental for warmth. The costume design for the film was based on original knitting patterns from the Edwardian period as well as photographs of the eldest Crowder sister, Grace, whose clothing was ‘reverse-engineered’ by specialist knitters. Looking around the exhibition, most of the items were knitted which is hardly surprising given that, traditionally, crochet uses more yarn, which isn’t conducive to the frugality that the war demanded. 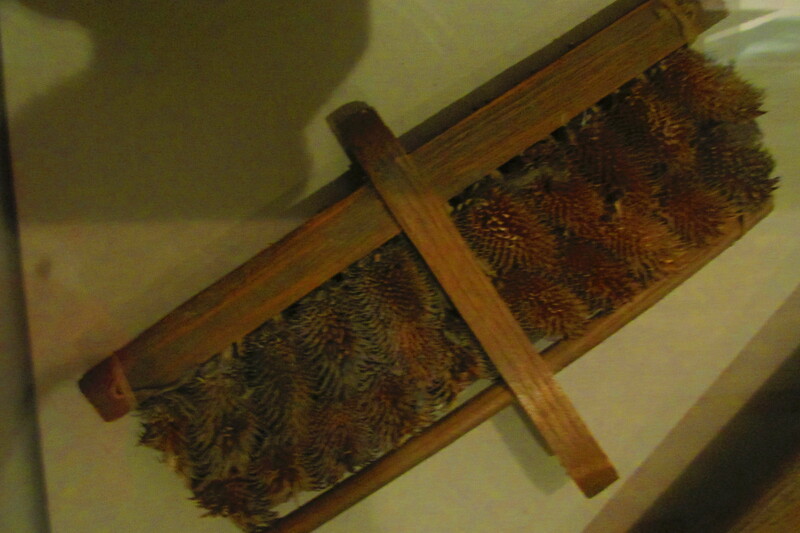 One of my favourite pieces was a knitted wrap waistcoat. Its maker said she was excited to see the way garter stitch was used in this pattern because people usually think garter stitch is boring. It has a crocheted embellishment on the belt, which I liked. Other crocheted items included a bag, shawls and hats. The most surprising item was a tie done in Tunisian crochet, certainly an unusual technique today as I suspect it was then, too. Commemorating a war through its woolies is an unusual venture, perhaps deemed too trivial in comparison with the horrors endured by the soldiers, or not dramatic enough to be considered. But knitting and crochet really did play an important, if understated, role. A trip to Cambridge Botanic Gardens on Sunday combined two of my major interests: horticulture and crochet. It was “Apple Day” which demonstrated the array of apple varieties (some hundreds of years old) with a chance to taste some of those cultivars that cannot easily be bought in shops, as well as offering produce such as chutney, cakes, juice and cider. While getting slightly squiffy on cider samples, I didn’t forget to go and investigate the “Hooked On Plants” display in the tropical glasshouses. Crafters often find inspiration in nature, be it colour combinations, autumn foliage or flowers. Lichen of the tundra is a less typical inspiration but it is the plant of choice for the exhibition, along with trailing plants from arid environments. 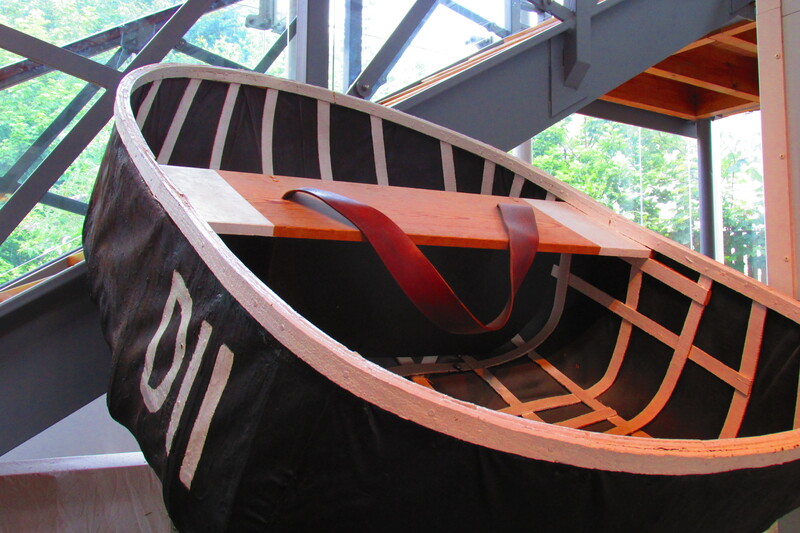 The project was undertaken by designer Joanne Scrace and the Cam City W.I., as part of the Cambridge Festival of Ideas. The underlying intention was two-fold: to highlight the diversity of plant forms as well as the availability of plant based fibres. 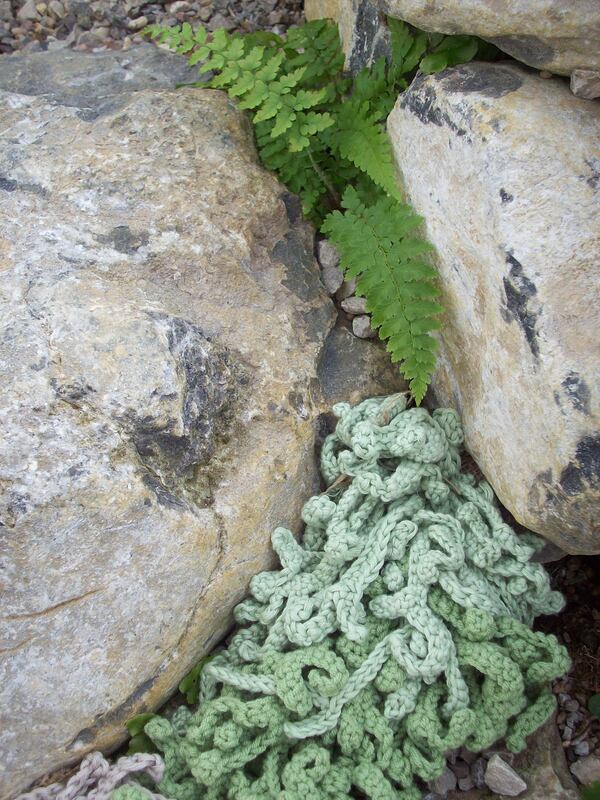 Lichen was represented by simple rows of stitches worked into foundation chains, and were nestled into rock crannies. Other more complex yarn plants involved the skills of increasing and decreasing to create, for instance, undulated or zigzagged leaf margins, such as those of the Fishbone Cactus (Epiphyllum anguliger); or the globose stems of plants adapted for water storage in deserts. 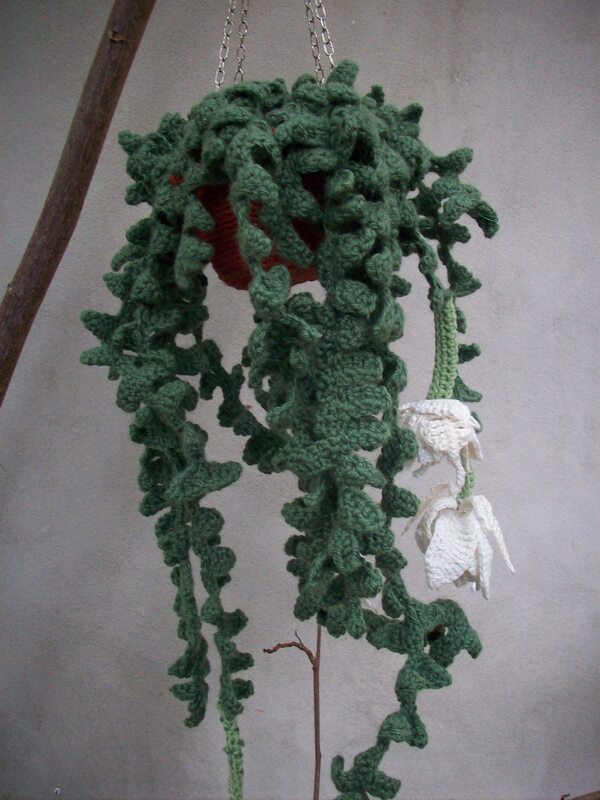 One crocheted plant of this type sat next to a sign explaining the “convergent evolution” of unrelated plants using similar survival mechanisms but originating from different continents e.g. Euphorbia obesa of the Euphorbiaceae family found in Africa, and Astrophytum asterias of the Cactaceae family from the Americas. 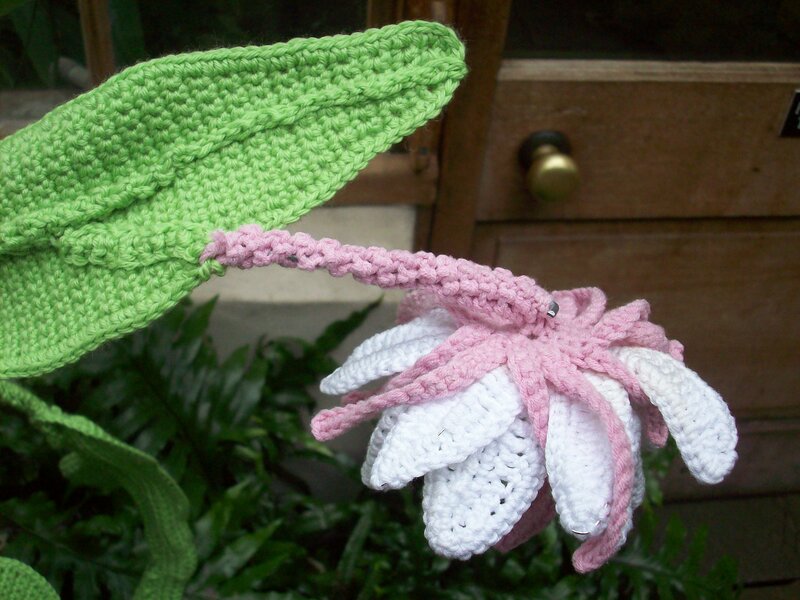 An overheard comment was an exclamation of how botanically accurate and recognisable these crocheted plants were, a credit to the women who made them (especially those who hadn’t ever crocheted before).